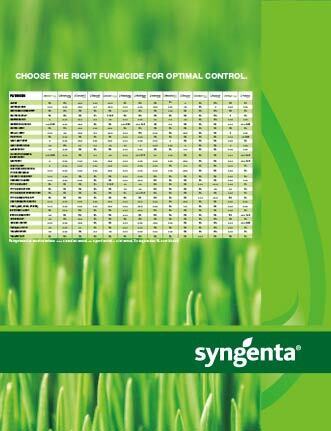 View the Labels/SDS information for Velista Fungicide. 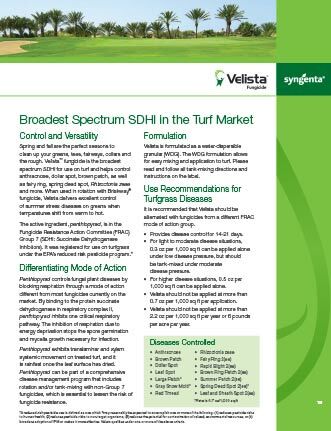 Velista® fungicide is the broadest spectrum and only SDHI labeled for anthracnose in the golf market. Spring and fall are ideal seasons to clean up greens, tees and fairways. In addition to controlling anthracnose, Velista also protects against dollar spot, brown patch and more. When used in rotation with Briskway® fungicide, Velista delivers excellent control of summer stress diseases on greens when temperatures shift from warm to hot. A Rutgers study1 shows Velista is proven to control common turf diseases like anthracnose, which leads to improved turf quality. 1Rutgers, 2016, Magnified at 60x. Applications made on a 14-day interval at 0.5 oz./1,000 sq. ft. of Velista and 0.34 fl. oz./1,000 sq. ft. of Lexicon® Intrinsic®. A year-long Penn State study1 on annual bluegrass shows Velista provides superior reduction of anthracnose and enhanced turf recovery under various stresses, including very low mowing heights. 1Penn State, August 8, 2017. Applications made on a 14-day interval at 0.5 oz./1,000 sq. ft. of Velista and 0.34 fl. oz./1,000 sq. ft. of Lexicon Intrinsic. Follow us on Twitter @SyngentaTurf and join the conversation with #Time4Velista. 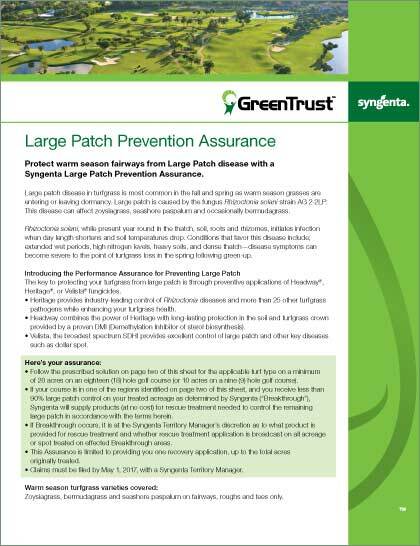 Protect warm season fairways from Large Patch disease with a Syngenta Large Patch Prevention Assurance. 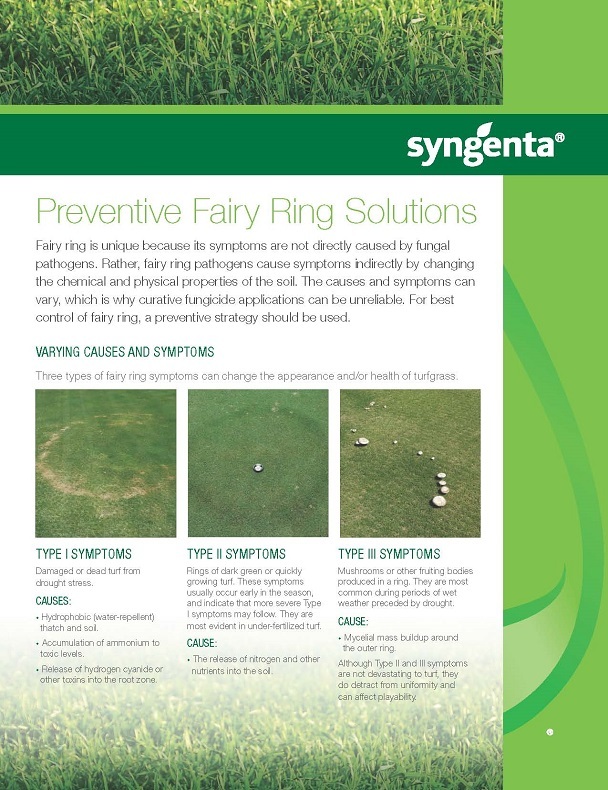 Learn about innovative solutions for fairy ring control. 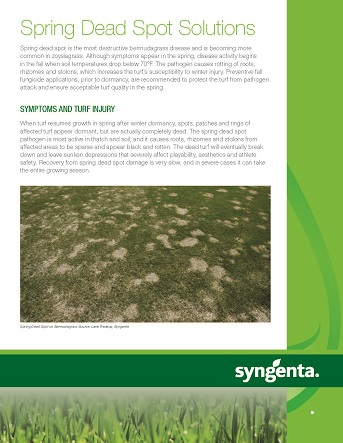 Learn more about Syngenta's innovative solutions for spring dead spot control. View Velista's performance against Rapid Blight, Spring Dead Spot and Fairy Ring. Velista®, Greencast® is a trademark of a Syngenta Group Company. Syngenta supports a FIFRA Section 2(ee) recommendation for Velista fungicide to control summer patch, brown ring patch, spring dead spot, fairy ring, leaf and sheath spot and rapid blight on all turf types. Please see the section 2(ee) recommendation to confirm that the recommendation is applicable in your state. Briskway®, Heritage® and Daconil® Action™ are trademarks of a Syngenta Group Company. Lexicon® Intrinsic® is a trademark of BASF. Secure® is a trademark of Ishihara Sangyo Kaisha, LTD.